Arrowed) is the Pro-Chancellor and Chairman, Governing Council, Chief Lawrence Ayinde Olakunle Osayemi (MON) speaking at a Dinner held in honour of Council members. Beside him (Left) is the Vice-Chancellor, Prof. Olusola Bandele Oyewole. 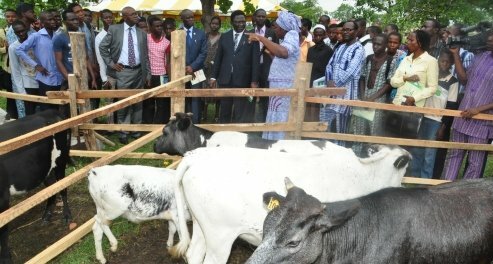 The Pro-Chancellor and Chairman, Governing Council, Federal University of Agriculture, Abeokuta (FUNAAB), Chief Lawrence Ayinde Olakunle Osayemi (MON) has expressed joy that the University is getting more visibility and respect internationally with the successful hosting of the 16th Triennial International Symposium. He made the disclosure on Sunday, at a dinner organised in honour of the Council members at the International Scholars and Resource Centre Guest House. The Pro-Chancellor stated that the immediate past President of the International Society for Tropical Root Crops (ISTRC), Professor Andrew Westby was so impressed by the University’s outstanding hosting of the Symposium such that he commended FUNAAB profusely. He congratulated the Vice-Chancellor for the successful hosting of the symposium, moreso that it was Professor Oyewole’s first international programme. Chief Osayemi, however, thanked members of the University community for their warm wishes on the conferment of the National Award of Member of the Order of Niger (MON) on him, praying that everyone very soon would also be recognised. In his Welcome Address, the Vice-Chancellor, Professor Olusola Bandele Oyewole said the dinner was organised to appreciate the Council members for their immense contributions to the physical development of the University, one of which is the IS&RC and also for them to have a feel of the great work they’ve been doing in the University. The Vice-Chancellor further stated that the successful hosting of the ISTRC Symposium at the befitting IS&RC edifice is making the University more prominent globally, adding that the National Resources Institute (NRI) of London has requested for a branch office at the Centre, among others. Responding to the success of ISTRC, the Secretary, Professor Lateef Sanni thanked the Pro-Chancellor, the Vice-Chancellor and the University management for their support towards making the Symposium a huge success. He, however, made case for the early commencement of the second phase of the building, adding that priority should be on the development of the Centre.